Imagine you are in an outer space version of the Hunger Games known as the Battle School. You will be here for several years while constantly being monitored and evaluated. While there are classes, the main thing that matters is your performance in a zero gravity battle arena where you struggle to beat enemies who are older, who have more experience and respect and who have help from the teachers. You must beat every single opponent you ever face because if you lose, it means that you are not perfect, and nothing short of perfection will allow you to graduate. Only perfection will enable you to destroy a hostile alien race that is bent on colonizing the entire universe and destroying any other contenders. It is under these circumstances that Andrew “Ender” Wiggin is brought into the Battle School a year earlier than anyone in the history of the school to begin his training for defending Earth from the third invasion. In the book Ender’s Game, humanity is not alone in the universe. A surprise attack by an alien race began the Human-Formic War, which has lasted for decades. In response to the threat, Earth has united under the common goal of surviving by any means necessary. The resulting Battle School has produced some of the greatest military minds of the human race. But time until the third invasion is running out, and earth needs a new kind of leader. And so Ender is taken through the Battle School’s most grueling program ever created. All he has to do is graduate alive and then defeat an invasion from an unrelenting, always-growing, always-learning alien race. But that is easier said than done. Orson Scott Card, the author of Ender’s Game, uses the alien threat to explore the competing ideas of sacrifice and survival. Ender is perpetually faced with the decision to either preserve himself by staying out of harm’s way or to save the human race by sacrificing himself. One of the main themes in the book is whether it is right for society to destroy some members for the survival of the rest. The students of the Battle School are six years old when they join. Contact between earth and the Battle School is basically impossible for students, and they do not see their families ever again. The entire program is designed to strip the students of any past allegiances or loves so that they may serve earth better. Ender eventually grows to understand that by committing everything to defeating the alien race commonly known as the buggers he will ultimately destroy himself. This idea is reinforced throughout the book as Ender takes on more and more responsibility and pressure. Another theme of the book is the struggle between those who want to push Ender to his limits and those who want to keep him safe. This struggle constantly places him in danger. Other major characters in the book are Ender’s two older siblings, Peter and Valentine. Both were unfit for Battle School because of their emotional tendencies. Back on earth we see Card using the characters to personify the two things that not only keep Ender going but nearly all humans as well: fear and love. Throughout the book, Ender is plagued by his inner conflict of loving his enemies but destroying them so that they can never come back to hurt him. Ender is also burdened with the understanding that he can never rely on anyone to take his place because he is the only way that humanity can defeat the buggers and thus continue to live. 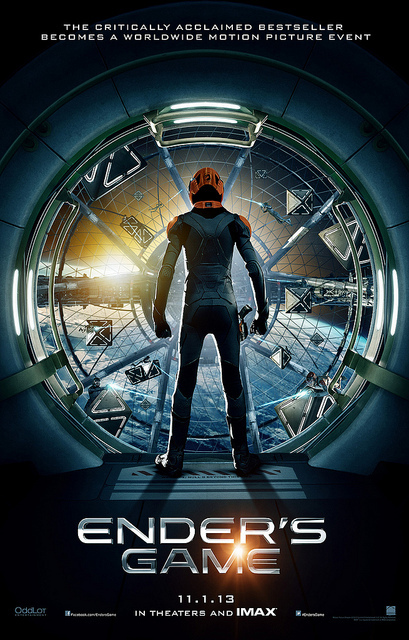 Ender’s Game leaves the reader not only with an awesome adventure, but also with several profound ideas about the human race and what we are willing to do to not only survive–but live.